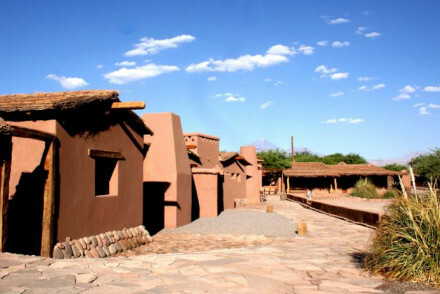 Walking through San Pedro de Atacama you instantly feel as if you've been dropped onto the set of a Western movie. In the heart of the driest non-polar desert in the world, the tiny village of old adobe houses clustered along dusty unpaved roads looks out onto an otherworldly landscape of rugged sandstone valleys, dunes, salt flats, boiling geysers and lagoons inhabited by flamingos - all in the shadow of massive snowcapped volcanoes - making it one of the most popular tourist destinations in all of Chile. In this mysterious, ancient world, it feels as if time has come to a standstill. With clear starry skies, jaw-dropping scenery and activities ranging from sandboarding to hot air balloon rides. Our collection of the best places to stay in San Pedro de Atacama range from trendy desert escapes to luxury hotels with spas. People flock to San Pedro for the landscape. Sublime, dreamlike and wild, the region sits in the heart of the Los Flamencos National Reserve - an extraordinary area - and one of the most beautiful in Chile, if not, South America. The Valley of the Moon is one such example: the moonlike landscape is peppered with craters, caves and dunes, and is immensely fun to explore. The Piedras Rojas is beautiful - a group of red sandstone rocks lapped gently by waves of the warmest blue - made even more stunning by the snowcapped volcanoes in the backdrop. Throughout this beautiful, barren land lie steaming geysers - hot springs that shoot up plumes of water into the air - best seen at sunrise when the waters shine red and gold. The Laguna Baltinache, a salt plain brimming with blue salt lagoons, is worth checking out: like the Dead Sea, you float seamlessly in the waters. In spite of being a remote, near-lifeless and barren land, there are some fascinating historic sites. On the road to Rio Grande you will find Yerbas Buenas, a series of petroglyphs - prehistoric carvings and paintings - which offer an illuminating insight into the beliefs and lives of our prehistoric ancestors. Be sure to check out the Pukara de Quitar, a pre-Incan fortress that's well over 700 years old, perched on a hill on the outskirts of the village. The village itself is small, a cluster of one-storey mudbrick houses, and aside from the charming little church at its centre, there is very little to see. However, the village is really the beating heart of all activity in the area, and is where you can book an ATV tour, a hot air balloon ride over the Atacama Desert or a sandboarding session in "Death Valley". But San Pedro's tiny size and lack of bustle is where its charm lies: the skies are unbelievably clear and are perfect for stargazing - you can even go on an astronomy tour. You will find that locals exhibit an extraordinary level of energy and positivity, and it is even said that the large quantities of copper and quartz in the region flood the population with good vibes. Explore the craters, caves and dunes of the Valley of the Moon. Visit the Piedras Rojas and marvel at the blueness of the water and the volcanos standing in the backdrop. Go sandboarding down the dunes of Death Valley! Hire a hot air balloon and float high above the Atacama Desert. Check out Pukara de Quitar, a pre-Incan fortress built 700 years ago. Float seamlessly in the salty waters of the Laguna Baltinache! This is a popular destination, so to ensure a room at one of the best places to stay in San Pedro de Atacama we recommend planning your trip well in advance. Hotel Altiplanico is a charming hotel with great views of the volcanoes from its desert location. It is traditional in style - built from mud brick. The rooms are simple yet atmospheric and dotted with artefacts and there is a lagoon style pool. Hotel Pascual Andino is a small boutique hotel with just ten rooms, in the centre of town. The design is mud brick and wood. All of the town’s historic attractions are within walking distance. An authentic Chilean experience. 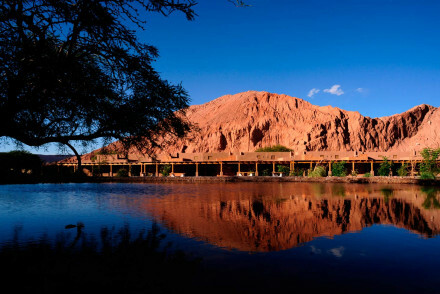 Cumbres Hotel and Spa is situated some 2km out of the village, on the edge of the Atacama desert. Interiors feature a mixture of the traditional and the modern being all glass walls and wooden furniture. There is a lovely relaxing spa and the desert views are stunning. 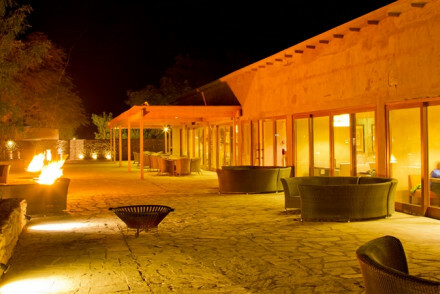 Tierra Atacama resort and spa is an elegant hotel in the Atacama desert. The rooms are chic and whitewashed with four-poster beds, bathrooms are contemporary and smart. The views are great, and there's a truly pampering spa as well! Awasi Atacama is an ultra cool desert retreat. The style is rustic, the cabins have polished wood floors, adobe walls and traditional hangings. The food is top notch. Great for the outdoors. Explora Atacama is a contemporary hotel offering simply styled rooms with glass, wood and white background, and spectacular views. Desert expeditions are available and there's a relaxing spa to unwind in afterwards! The restaurant serves excellent regional fare - a unique stay. 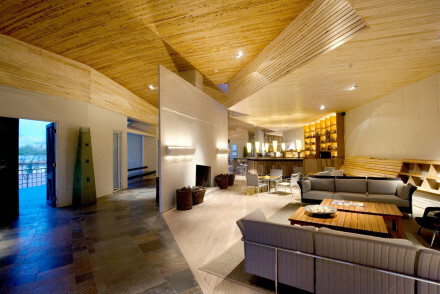 Alto Atacama is a chic property set in the heart of the world’s highest desert. The feel is contemporary style meets traditional charm. The rooms are light and airy and there's a lovely spoiling spa. Check out our partner Booking.com to see their wide range of villas and apartments. Fly to Santiago, then to Calama where you can get a transfer bus ride to San Pedro. If you want to rent a car we recommend contacting our partner Rentalcars. During the summer, the temperature averages at around 27 degrees and this is the best time to plan your trip. For more spectacular Chilean landscapes why not browse through our collection of properties in Puerto Natales. Or widen the net to include all the best place to stay in Chile. A charming hotel located in the stunning Atacama Desert, boasting spectacular views of the surrounding volcanoes. Atmospheric rooms, built from mud brick, are simple in style and dotted with artefacts. The lagoon style pool is the perfect spot for lounging in the sun. Active Holiday - An ideal spot for those seeking the thrills of the great outdoors, and to relish the epic landscape. Birdwatching - Spot flamingos, plovers and geese in the highland lagoons. A small boutique hotel in the heart of the historic town centre. 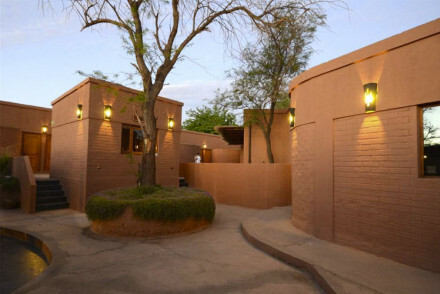 Atmospheric mud brick and wooden rooms are traditional in style. Quiet terraces are perfect for unwinding with a good book. Find many of the town's attractions within walking distance. Ideal for an authentic Chilean experience. Local exploring - Well located within the town's historical centre with many attractions nearby. Sights nearby - Just 150m from the town's traditional Church. 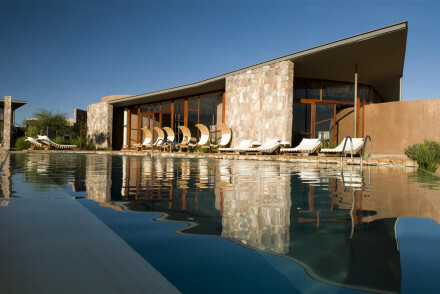 A secluded hotel and spa located next to the stunning Atacama Desert. Rooms mix traditional materials with contemporary style; think glass walls and wood furnishings. A glorious spa will soothe any aches and pains and numerous guided expeditions will satisfy the most adventurous souls. Total relaxation - Boasting a remote location and a spoiling spa this is the ideal spot to get away from the rat race. Active Holiday - The Cordillera de Los Andes provide plenty of opportunity for outdoor pursuits. Sights nearby - Embark on an archealogical tour of the Tulor- Quitor and Inca ruins. A chic hotel in the stunning Atacama Desert. Elegant white washed rooms featuring four poster beds, contemporary bathrooms and lovely views. The Uma spa is totally pampering and the pool heavenly. The surrounding landscape is primed for outdoor pursuits. A fabulous stay. Active Holiday - Situated in the epic landscape of the Atacama Desert, ideal for those searching for outdoor pursuits. 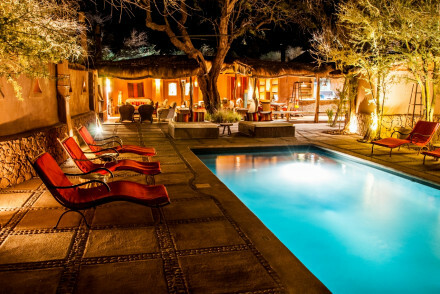 A rustic chic hotel set in the outstanding Atacama Desert. Atmospheric cabanas have smart polished wood floors, abode walls and traditional wall hangings. Superb cuisine is served up using mainly local produce. Find an abundance of adventures and outdoor pursuits in the surrounds. Active Holiday - A myriad of landscapes from volcanoes to salt flats, lagoons and sand dunes, all primed for outdoor pursuits. Restrictions on children - Children over five years old are welcome. A contemporary hotel in the spectacular Atacama Desert. Simply styled rooms feature plenty of glass and wood set against a white background. Feast on regional fare, marvel at the spectacular views, unwind in the spa and embark on one of the many desert expeditions. A truly unique stay. Active Holiday - Located in the stunning Atacama Desert and with 40 curated expeditions in foot, horseback or bicycle. A chic property that's all about the location. Sat in the heart of the world's highest desert. Contemporary style meets traditional charm in the light and airy rooms. A spoiling spa is a must visit when you get time from visiting the spectacular natural sights in the area. A truly unique stay. Back to Nature - Located in the the heart of the Atacama, the world’s highest desert. Sights nearby - Visit the altiplanic lagoons and the geysers at El Tatio. Birdwatching - Go flamingo spotting at the Salar de Atacama salt flats.